I am watching on Facebook, the atmosphere and the girls are like giving speeches in a memorial service. Very sad! Last edited by Sophia7 on Wed Oct 25, 2017 9:24 pm, edited 1 time in total. i have mix feelings.. There are some technical flaws and i dont know but its kinda boring to me...the host were having difficulties in connecting to the audience. Overall it was ok but a bit unorganized. I like the winner and the runner ups... Its hard to see girls in the bsckground doing sloppy positions and worst some move out and went backstage. I am still sure by end of this year GB website will give this pageant a good score and ranks them 2nd or 3rd coz its their job to give good points to survive there business.. its Miss Universe always the supreme World then Earth..
Last edited by UniversoMundoTierra on Thu Oct 26, 2017 4:50 pm, edited 2 times in total. THE SHOW WAS JUST UTTERLY.......DEAD. EVEN THE CROWD. AND I JUST DON'T GET THE ADVOCACY OF THIS PAGEANT, IT JUST SEEMS VERY UNREALISTIC. HAPPY FOR THE WINNER AND THE RUNNER-UPS. NEED I SAY, SOME SPECIAL AWARDEES ARE JUST "THERE" FOR A REASON. CIAO! MGI 2017 concluded with a bundle of irreversible woes! Blind fanatics should now absorb the onus of the burden more than what the organizers can share. Blatant production flaws and a failed expectation. Enough of that! Congratulations Ms Grand Philippines Elizabeth Durado Clenci for carrying the torch. You've gone that far and you succeeded. Being the only Asian in the winner circle of 5, we are so proud of your achievement! Goodluck in all your future endeavors! Yun lang yun eh. Yung mairaos lang ng isa pang taon. Kahit palpakers. Wala yan kay Nawat. Naibulsa na nya lahat ng kita. So see you next year na. to be fair, I like the part where Nawat took the MGI crown and replaced it with a giveaway crown. I think it gives meaning to the transition. But the pageant has no life. Nicole and Liam were a good host. They tried to keep it alive. To Stella - if you want to win the MGI crown, crown a Binibini who is so facially beautiful. I think MGI is looking for a pretty face. To be honest, MGI is perfect for Mariel de Leon, because she is not afraid to go to war! And Mariel has a very pretty face. Or Katrina would have been perfect as well! I think Clenci did well during Gown competition. Peru is facially beautiful. Her gown is the bomb! Shaken&stirred wrote: THE SHOW WAS JUST UTTERLY.......DEAD. EVEN THE CROWD. AND I JUST DON'T GET THE ADVOCACY OF THIS PAGEANT, IT JUST SEEMS VERY UNREALISTIC. They need to change their advocacy to "stop the violence". First, Nawat and his own countrymen need to live that first. Sophia7 wrote: to be fair, I like the part where Nawat took the MGI crown and replaced it with a giveaway crown. I think it gives meaning to the transition. But the pageant has no life. Nicole and Liam were a good host. They tried to keep it alive. That's the originality they have. THE MUSIC THEMES ARE ORRIBLE, SORRY FOR PINOY FANS BUT NICOLE CORDOVES IS WORSE AS A HOST. I LIKE XIAM, BUT THE AUDIENCE IS NOT THE BBPILINAS CROWD. HE HAS EXAGERATED A BIT. 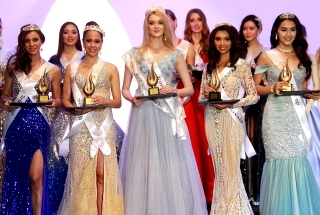 THE ONLY PAGEANT THAT ARE WORTH TO BE COVERED ARE THE BIG 5! That is your opinion and you are entitled, right? Aren't we entitled to make our own choices? What gives you the right to dissuade those who derive free entertainment value from watching the proceedings as they unfold? Do we even have to listen to what you say? Why is that? Pageant fans, never mind the relative ranking, hunger for this kind of news and are asking for updates. Mainstream media will not lift a finger in reporting the sorties. Who then will, except for Missossology? The girls are working hard to realize what they believe is their time to shine. The effort is there. And I don't think it is any of your business to dictate what you vs what the others want! Your bravado is entirely misplaced. Last edited by beautywatchnyc on Thu Oct 26, 2017 6:15 pm, edited 1 time in total. Wow to think that this pageant never did anything else in the entire competition but do rehearsals rehearsals and rehearsals--their final night is as crap as if no rehearsal at all. So what are they doing the entire time--just do picture taking? Geeyourhair wrote: Wow to think that this pageant never did anything else in the entire competition but do rehearsals rehearsals and rehearsals--their final night is as crap as if no rehearsal at all. So what are they doing the entire time--just do picture taking? They did something, walking inside a cave where the reporters misidentified the reigning queen as among the contestants and immediately left after knowing she wasn't actually a contestant. 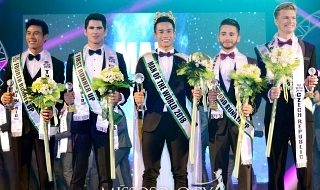 They also spent their time mocking Miss Earth while the latter is enjoying its pre-pageant events around the Philippine Islands. They also attempted to plant a tree or should I say, a leafless trunk, wearing improper clothing. It seemed that the audience was very reserved. They rarely reacted to the hosts who tried to interact and get a reaction from them. That, or maybe they did not understand the hosts. Compared to last year, even the introductions were a notch down. No shrill voices shouting their country at the top of their voices...maybe a bit over the top but I'd rather have that than to see girls who were not fully committed to the act. Maybe the production was "tamed" to suit the sensibilities of the Vietnamese people. honeymae7405 wrote: It seemed that the audience was very reserved. They rarely reacted to the hosts who tried to interact and get a reaction from them. That, or maybe they did not understand the hosts. Just watched Miss Earth 2010 on Youtube. I don't think the audience was the problem. Maybe not enough interest by the local people. They did not even trend on social media. 7 year difference, dear. 7 years! You're comparing this year's MGI with Miss Earth 2010, when MGI was not yet even born? And the interest of Pinoy pageant fans was not yet at it's peak? What do you expect? Even Instagram was not yet created at that time (not sure though). Compare that today, where Pinoy fans are in a frenzy state to support our candidates anytime, anywhere. 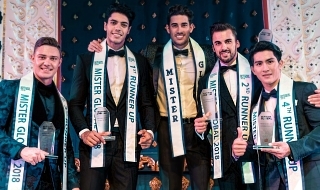 Plus, social media in 2017 has a big difference with 2010, further increasing the avenues to get yourselves informed with the latest pageant news. As usual, inggit na inggit kayo kay Nawat at sa MGI, kaya dinadaan nyo na lang sa pintas, pero in reality, nagpuputok ang mga butse nyo sa ingget ! Violeta Urduja wrote: As usual, inggit na inggit kayo kay Nawat at sa MGI, kaya dinadaan nyo na lang sa pintas, pero in reality, nagpuputok ang mga butse nyo sa ingget !